The eagle owl is the largest owl in Europe. 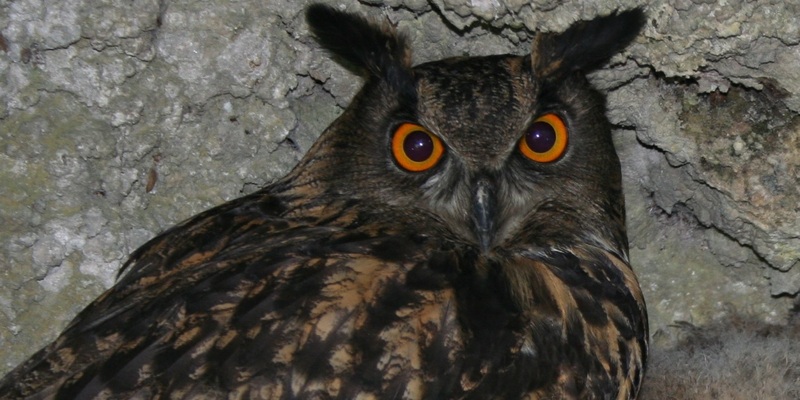 It is brown, with cream or dark spots in variegated plumage; it has a big head, with ear tufts of feathers very evident over the eyes and big yellow-orange eyes. The beak and the legs are powerful, with long sharp claws. It has a considerable wingspan, which reaches 188 cm in females and the body length is about 67 cm, males are slightly smaller. It is a sedentary species, located on the most impervious cliffs, above the wildest oak forests with open areas suitable for hunting predominantly small mammals, but also birds and other animals. It is extremely sensitive and the slightest disturbance can cause the abandonment of the nest: leisure activities often take people unknowingly near nests. It suffers from human persecution and poisoning from mercury seed-dressings, and deaths through road traffic, barbed wire and overhead wires are not insignificant (IUCN, 2017). Locally, the deterioration of forests, the increase in intensive agriculture (orchards) and the consequent reduction of prey, the use of rat poison and the presence of roads and power lines that interrupt environmental integrity, are the main threats to this species. Till 20 years ago there were three couples nesting in the site IT4070011 Vena del Gesso Romagnola. Now the species can be found only in the area of Monte Mauro, where one pair is still nesting. In this area we will maintain and improve forest structure and composition, thus increasing biodiversity and, therefore, the abundance of prey. In addition, we will create some open spaces and clearings, suitable for hunting by the eagle owl.